23 Envelope were one of the most original and signiﬁcant British design teams of the 1980s. Their record sleeves for the south London independent label 4AD had an enormous impact on a generation of younger designers who would go on to make their names in the 1990s – people like Graham Wood of Tomato and Jonathan Barnbrook. But while members of experimental design’s future cognoscenti knew the work, 23 Envelope, which disbanded in 1987, was never a household name within the design community. The ﬁrst detailed article about the team did not appear in a design magazine – Emigre – until 1988, by which time more publicity-conscious and fashionable British designers such as Neville Brody and Peter Saville – their contemporaries – had received many column inches of coverage. Today, it is doubtful that many designers, especially younger ones, would have any idea who, or what, 23 Envelope were. In fact, one member of the team – Vaughan Oliver – did go on to establish an international reputation after 23 Envelope ended. Oliver formed a new studio, V23, and forged creative relationships with a wide range of collaborators. He continued to work in-house at 4AD and as a result, 23 Envelope’s work, created from 1981 to 1987, became absorbed into his own back catalogue – quite literally. The actual catalogue for Oliver’s ﬁrst retrospective, in Nantes, France, in 1990, compounded this impression. 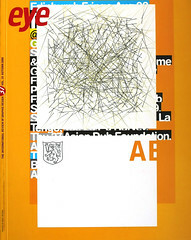 The book’s layout, by Oliver, mixes together work by 23 Envelope (which forms the bulk of the ﬁrst edition) and V23, and does not display the projects in a clear chronological order, obscuring – doubtless unintentionally – the true sequence of events. It makes it look as though everything in the book issues from a single person’s vision: Oliver’s. It subtracts nothing from Oliver’s achievement, however, to recall that 23 Envelope consisted of two people, friends and collaborators, working together in a spirit of close creative synergy. Reassessing their body of work at this distance it is quite clear that Nigel Grierson, Oliver’s partner, has not received anything like sufﬁcient credit for his role in these seminal designs. I thought I knew these images well, but studying them again, in the course of writing a monograph about Oliver that addresses both phases of his career, I was amazed by their quality. In the US, April Greiman’s graphic achievement, from roughly the same period, is well known. She is widely understood to be an innovator, a designer who brought intense subjectivity and her own private symbolism to her designs and pushed graphic communication a step closer to ﬁne art, making possible much of the most celebrated work of recent years. 23 Envelope can be seen as equivalent British ﬁgures. More than any of their contemporaries, with the possible exception of Peter Saville, they expanded the artistic vocabulary and ambient possibilities of the graphic image. Combining design, photography and later video, they are forerunners of Tomato and other teams that went on to defy graphic design’s conventional boundary lines in the 1990s. As many of 4AD’s original fans could testify, 23 Envelope’s sleeves for bands such as Modern English, the Cocteau Twins and This Mortal Coil are charged with a commitment, a depth of emotion, a lasting mystery and an electric power to make the viewer’s ﬂesh tingle that marks truly exceptional work. Oliver and Grierson met in their late teens, as schoolboys, at Ferryhill Comprehensive, County Durham. Their friendship began in the art room, chatting about their mutual passions for art and rock music. For both of them, designing album covers – the medium was then still a twelve-inch mini-canvas – was a natural ambition. ‘Record sleeves,’ says Grierson, ‘seemed like the greatest thing you could possibly do.’ In 1976, Oliver began a graphic design degree at Newcastle Polytechnic and, a year later, at Oliver’s suggestion – as Grierson recalls it – his friend decided to join him. Both came under the spell of Terry Dowling, a Royal College of Art illustration graduate, who ran the second-year design course. They still speak of him as their mentor. Grierson graduated a year after Oliver and, in 1980, they both moved to London. Oliver, a talented draftsman more comfortable handling imagery than type, planned to become an illustrator. Grierson had at ﬁrst nurtured the same ambition, but in his ﬁnal year he decided to pursue his growing interest in photography at the RCA. For three years, Oliver worked as a packaging designer, initially at Benchmark, then at Michael Peters & Partners, where for the ﬁrst time, searching through old type encyclopedias for half-forgotten faces that evoked stimulating atmospheres, he became fascinated by typography. During this period, Oliver met Ivo Watts-Russell, founder of 4AD, and both he and Grierson undertook regular freelance assignments for Ivo (as he was known) until, in 1983, Ivo offered Oliver a full-time job, as the tiny label’s only other employee. The ‘Sleeve by 23 Envelope’ credit was a piece of deliberate mystiﬁcation on their part. Oliver remembers it as being inspired by a pack of envelopes next to them when they were trying to think of a name. They hoped that a ‘company’ name would make 23 Envelope sound bigger than it was – Grierson’s student placement had been at Hipgnosis – and had vague plans to change it with each new release. The idea of this ‘self-sufﬁcient unit’, as Oliver described it, was to allow them the freedom to avoid rigidly assigned roles and to merge initial concept, art direction, photography and design in a single, jointly authored and signed creative act. Such was their mutual understanding as artists and their closeness as friends and collaborators at this point that a piece could be credited to 23 Envelope even when only one of them had been involved in its creation. By 1984, 23 Envelope’s use of the formal design term ‘corporate identity’ to describe the organic evolution of 4AD’s visual programme was explicit. Their aim, they explained in a fanzine, was to create sleeves that reﬂected the intentions of 4AD’s individual artists and the atmosphere of their music, while retaining a distinct visual identity for the label. The introduction to commercial design and packaging that Oliver had received as a ﬁsh out of water at Benchmark and Michael Peters would now be ‘perverted’ to interpret the vision of 4AD bands such as Xmal Deutschland and Colourbox. Inspired by the music, 23 Envelope would ‘project their own personal world of imagery in collusion with the artists they represent’. Sharing Ivo’s musical values and independent label ethic, they rejected the hard sell, the well trodden path, the merely fashionable, tedious pastiche and the banal overuse of the band photograph (many of 4AD musicians were equally keen to avoid anything as obvious as cover portraits). On no account, Oliver and Grierson felt, should the taste and discernment of the audience be underestimated. Record buyers should be seduced or challenged by visual landscapes as resonant as the soundscapes they expressed. The inﬂuences that helped to shape their shared sensibility mostly came from outside design. The atmospheres they admired in literature, music and ﬁlm were dark, brooding, bizarre, enigmatic – images of the tormented self alone in the world. Grierson introduced Oliver to Beckett’s plays and prose works and they immersed themselves in classic outsider and existentialist ﬁction by Knut Hamsun (author of the extraordinary early Modernist novel, Hunger), Kafka, Camus and Sartre. This was the period of post-punk ‘industrial culture’ and British bands like Joy Division and the Cure provided a doom-laden soundtrack to their reading. Struggling to translate these intimations and forebodings into a new kind of graphic expression, 23 Envelope used blurred forms, abstract traces and an exquisite ornamental typography that felt strangely ‘out of time’ to conjure alternative worlds of deliriously intense feeling. Their liquescent early covers for the Cocteau Twins, shot in a tank by Grierson, were prompted by a scene towards the end of Andrei Tarkovsky’s visionary ﬁlm Stalker, where the camera looks down at a shallow pool in a ﬂooded room deep inside the mysterious Zone and two ﬁshes swim across broken tiles as the water darkens with ominous black ﬂuid. On the paired Cocteau Twins EPs Tiny Dynamine and Echoes in a Shallow Bay (1985), they used coloured inks, which bubble and swirl and boil in the water like dense clouds of liquid gas, a ﬁtting image for a form of rock music described by critics as ‘miasmic’ and ‘oceanic’. Precise editing of supplementary images – one cold and agitated (Dynamine), one warm and vaporous (Shallow Bay) – establishes a ﬁlmic tension in the contrast of visual moods and delineates the emotional range and tonal colour of the music. 23 Envelope wanted sleeves to have a strong ‘tactile’ presence, and lavish swathes of texture – ‘We express ourselves with textures,’ Oliver declared – soon became a favourite device. Mainstream design’s vision of reality was clean, brightly lit, direct and efﬁcient. 23 Envelope’s underworld of texture was dirty, murky, ambiguous and uncertain. On the tenebrous cover of Xmal Deutschland’s Fetisch (1983), pieced together from fragments of Japanese rag paper held together by masking tape, Oliver dispensed with the expected cover image and succeeded in imbuing ordinary bits of paper with dark portents of existential menace. The sleeve for Richenel’s L’Esclave Endormi (1986) juxtaposes vertical bands of rag-paper texture with Oliver’s ethereal type choices and Grierson’s misty photographs of a youth’s torso to summon an atmosphere of languid sensuality and decadence worthy of a symbolist poet or painter. By the time 4AD released the Lonely is an Eyesore compilation (1987) – a tour de force of dense textural abstraction – a concern with texture had become one of the deﬁning styles of the decade, seen in illustration, photography, interior design and, increasingly, in graphics. It was the last signiﬁcant project to which Oliver and Grierson jointly contributed as 23 Envelope, although their roles were now strictly deﬁned. Oliver was responsible for all aspects of the artwork, while Grierson shot the video clips, including a superbly atmospheric narrative interpretation of Dead Can Dance’s ‘The Protagonist’. After receiving his photography MA, Grierson had begun a PhD in ﬁlm at the RCA, and his other activities meant his involvement in 23 Envelope was always intermittent. Oliver, based full-time at the 4AD ofﬁce, was the musicians’ usual ﬁrst contact (after Ivo) and he would call in Grierson if a project lent itself to a photographic approach. As time passed, Grierson became increasingly concerned about the lack of explicit credit for his pictures. Oliver resisted, preferring to preserve the original 23 Envelope signature and ‘myth’. By 1986, however, sleeves had started to appear with Grierson’s name, though not with Oliver’s. At the same time, as Grierson explained, his aesthetic was not always appropriate and he preferred to work with musicians with whom he felt a mutual empathy and understanding, rather than attempt to adapt his photographic style in a way that was untrue to his vision. Oliver, for his part, found this limiting. There were occasions, especially while creating covers for the Cocteau Twins, when his freedom to respond graphically was inhibited – as, for instance, with Victorialand (1986), where the photographs are unambitiously displayed like paintings on a gallery wall. He wanted to work in a wider range of graphic idioms and registers than Grierson’s photographic preferences could support. In 1987, he began to collaborate with other photographers and gave himself a printed art direction and design credit for the ﬁrst time. Oliver succeeded in broadening his approach, but many of the most ravishing V23 designs for Lush and the Pixies, created in 1988-91 – the period of his growing international acclaim – have obvious roots in his earlier collaborations with his boyhood friend. Grierson, meanwhile, set out on a career as a promo-maker, working for labels such as Virgin, Sony and A&M, before moving into TV commercials, with occasional forays back into photography. In recent years, he has written several speculative screenplays. His visionary style has won respect from colleagues, but he has never received the degree of recognition given to Oliver. ‘He’s a home-builder and I’m a nomad,’ Grierson says. ‘He stays with one thing and makes the most of it, whereas I make a ﬁre and then move on.’ The ﬁre he made with Oliver, as 23 Envelope, still burns with a strange and spectral light.